After a bit of a slow start in the tablet space it appear that chip maker AMD is steeping up their game when it comes to Windows 8 tablets against rivals Intel and ARM, and will apparently be announcing somewhere between six to nineteen slates sporting the Z-60 Hondo chip. According to an article over on PC World, the director of marketing for AMD, John Taylor has said that these new Windows 8 tablets with the Hondo chip are to be announced in January possibly during CES 2013 in Las Vegas, whilst AMD is also looking forward to the new tablet chips called Tamesh and Kabini that feature next generation graphics cores and between two and four CPU cores. 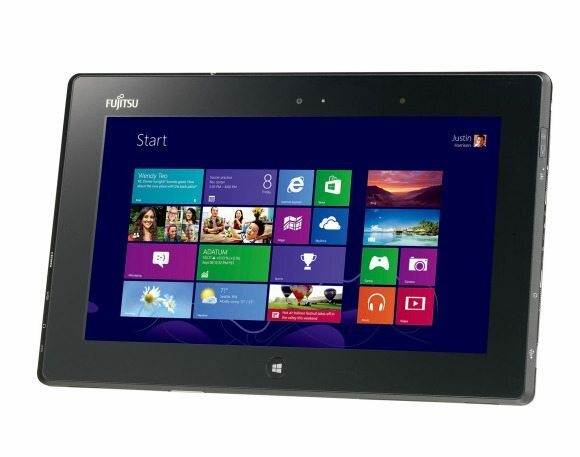 The Fujitsu Stylistic Q572 is currently the only Windows 8 slate that sports the dual core Z-60 Hondo chip, which is a 10.1-inch tablet featuring a removable battery, two camera, and weighs more than many Windows 8 slates coming in at 748 grams and commands a price tag of 90,800 yen, which is roughly 1136 US bucks. Those new Tamesh and Kabini chip will be released sometime in 2013, and are said to bring better battery life and performance to tablets, whilst the Hondo chip is based on the firms old chip roadmap, whilst the new chips next year will have the more power efficient and speedier Jaguar CPU core that is par of AMD’s new roadmap. The principle analyst at Mercury Research, Dean McCarron has said that AMD has to face off against both Intel and ARM as it attempts to get into the tablet space, and Microsoft unveiling Windows 8 for x86 chips provides a way in for AMD. McCarron went on to say that Hondo is a re-purposed netbook chip, and is adequate for tablets, however the question still remains just how competitive AMD can be in the tablet space. AMD are better than Intel for low end gpu and prices. Dear Hp, please use AMD. a 10″ tablet with dual core anything for $1100 USD is a non-starter no matter who makes it. and AMD using Hondo as the article calls it “a repurposed netbook chip”. Is a never gonna start. someone needs to survey buyer expectations at AMD, Microsoft and Fujitsu.